Is Healthy Eating Possible at Boarding School? - SchoolFinder.com! We have thought of absolutely everything to make students feel at home while living away for the first time! Canadian boarding schools build strong and durable foundations in preparation for life in a way that cannot be replicated in any other educational setting. While boarding school offers a variety of benefits, including academic and extracurricular opportunities that extend beyond the classroom, services and amenities that create a home away from home and teach lifelong healthy habits is equally as important. Great food and excellent service are the hallmarks of dining services and residence life, not to mention providing nutritiously balanced meals that appeal to a variety of taste and dietary preferences. The dining hall is the heart of campus – the place where everyone gathers to share food and time. Over the years, campus dining has transformed significantly, and today’s students are offered a plethora of options that celebrate both domestic and international cuisine while catering to a broad range of needs. Most schools also offer gluten-free, vegetarian and vegan options, among others, and can work with students who have other dietary restrictions to ensure they have nutritious and delicious meals. Peanut- or nut-free dining halls are the standard and healthy options are always on the menu. 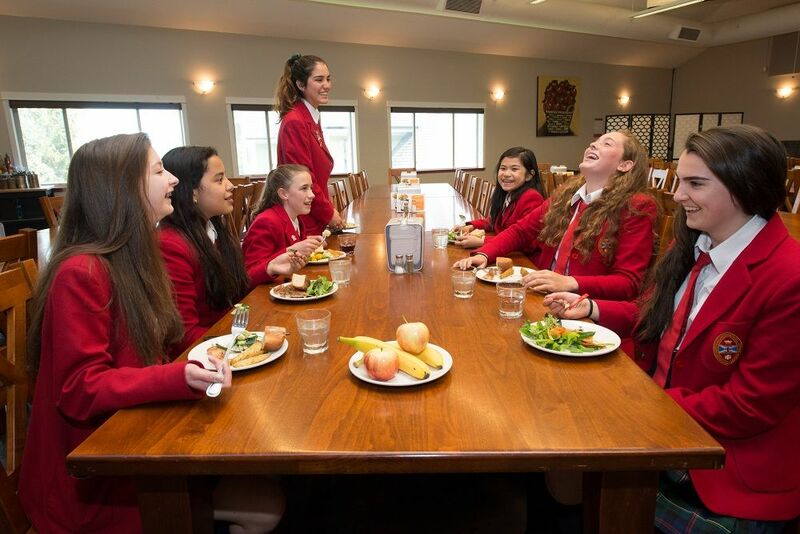 In 2017, St. Margaret’s School (SMS) for girls in Victoria, BC, partnered with SAGE Dining – the leading foodservice provider for independent schools and colleges throughout North America. SAGE has a focus on safety, quality service, community, nutrition, education, sustainability, and delicious food made from scratch using seasonal, locally-sourced ingredients. With the help of the SAGE program, students develop a positive relationship with food and make informed choices. Registered Dietitians review each menu before it appears online to ensure that there are healthy, nutritionally diverse options for everyone. SMS uses the SAGE Spotlight Program to create menus with variety, balance, and moderation. Every dish is assigned a colour-coded dot indicating its nutritional value, including fat, salt, and added sugar content. The dot system signals whether one should eat lots of a certain food or enjoy it only in moderation. The dining program also offers a comprehensive app that empowers guests with food allergies to manage their diets in the safe, transparent dining environment. The innovative online filter allows parents and students to view the ingredients in a dish and plan a safe, delicious and healthy meals accordingly. “Through conversations and the shared experience of eating together, we hope to build connections between boarders and day students. Food also plays a huge part of the identity of every culture and can be used to celebrate our diversity and strengthen the community,” said Nicole Folkes, Director of Residence at St. Margaret’s.